After coexisting as close cousins in the world of life sciences, the bioprocessing and cell therapy industries now find themselves as possible allies in the pursuit of solutions to small–batch-size production technology. As cell culture titers continue to increase and biotherapies become more “personalized,” pressure is increasing on the bioprocessing industry to find more cost-effective and flexible technologies for producing smaller batch sizes than before. At the same time, the cell therapy industry (renowned for its small–batch-size production) continues to gain momentum, with a significant number of therapies now in clinical trials. Cell therapy companies with products in clinical trials must address the critical challenge of establishing their own approved processes suitable for commercial-scale good manufacturing practice (GMP) production. Closed, integrated processing technologies address many converging needs in both the bioprocessing and cell processing markets, enabling a paradigm shift in the commercial viability of small-batch processing. After exploring specific challenges of such processing and describing several technologies already in use, here I will identify where technology gaps still exist. Pioneering cell therapy companies are successfully navigating their way from clinical trials to commercial production. Allogeneic or Autologous? The industry continues to debate whether allogeneic or autologous therapies will ultimately be most successful. In the former approach, one batch supplies multiple patients (a product model). Proponents say allogeneic products are easier to scale up and will therefore be lower in cost. They reflect the existing pharmaceutical business model. Autologous therapies (one batch supplies each patient in more of a service model) are safer, with no risk of adverse immune reactions. It may be argued that they are more effective outside immune-privileged cell types. Time will resolve the relative success of these two therapy types. Existing technologies already common in the broader bioprocess industry provide a useful starting point. However, achieving commercial success with very small batch sizes (as for autologous cell therapies) will require some fundamental changes in thinking to address key challenges. Reimbursement is likely to be a critical success factor for all cell therapies. However, it is important to recognize that this is usually relative to the cost of a current standard of care. For a therapy to succeed in a large disease market such as those for treating diabetes and cardiology, minimizing the cost of a therapy will undoubtedly be a primary requirement. With diseases for which the current standard of care is either more expensive or less effective than a potential cell therapy can be, commercial success actually could be less tied to cost. Minimizing the cost of a therapy should always be a focus, however, because lower cost allows more patients to afford a therapy — or provides for higher margins on the product. Through the life of a cell therapy product, both of those are likely to be true. So the key challenge remains: how to achieve an “affordable” cost of goods (CoG). When considering a CoG challenge, it is important to think beyond the simple cost of labor, which is a common mistake when companies investigate the possibility of process automation. Labor costs are important, especially when you factor in the level of skill required to perform many manual processes associated with cell therapies and how labor-intensive such laboratory-derived processes can be. However, reducing labor content alone will contribute only modest cost reductions. 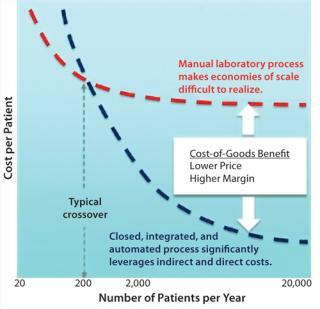 Automated and Manual Processes: To create a step change in the cost of a cell therapy, a company must first understand all its associated cost driver: raw materials, consumables, processing equipment, facilities and infrastructure, operating costs, quality control (QC) tests, batch records, labor, logistics, and supply. When all those factors are taken into consideration, closed, integrated, and automated processing strategies (the alternative to manual processes) demonstrate an ability to deliver significant cost reductions: as much as 90% in some cases (Figure 1). This holistic approach to reducing CoG could make both allogeneic and autologous cell therapies extremely cost competitive with the current standard of care for many diseases. And many techniques evolving for very small-batch manufacture in cell therapies are translating into the bioprocess domain. For example, functionally closed processing is an extension of “single use” that enables manufacturing operations to be performed in gray-space areas. Is Scale a Threat to Commercial Success? When it comes to commercializing a cell therapy, one of the most important challenges is how to scale its manufacturing process cost effectively. Before discussing this topic, it is important first to put “scale” into perspective. When most people imagine scale, they often visualize a conventional bioprocessing facility with typical batch sizes of 2,000-L or more. From a cell therapy perspective, that is huge. Before production at such scales can commence, a process is first developed using small batch sizes before progressively “scaling up” to the ultimate production batch size. Although the methodology and technologies for managing scale-up are quite well defined in bioprocessing, they are not without challenges. The primary argument in favor of allogeneic therapies is that they are more readily scaled than autologous therapies can be. Mesenchymal stem cells for regenerative medicines may be cultured at ≤2,000-L batches, but many allogeneic batch sizes are more likely to be in the 5- to 50-L range. That may be typically larger than autologous scales (1–2 L), but it is by no means “large” compared with typical bioprocessing. Both allogeneic and autologous can be considered “small-batch production” by comparison. Many technologies that enable economies of scale to be realized in bioprocessing through scale-up simply don’t apply to small-batch cell therapies. 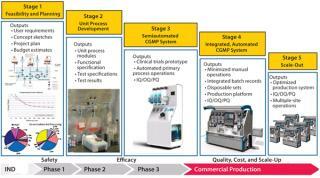 However, through some creative thinking and innovative engineering, conventional laboratory-scale techniques used in process development and emerging small-batch processing (e.g., single-use technologies) can be adapted for commercial-scale production of cell therapies. For example, Wave/Cellbag bioreactors and ReadyCircuit assemblies from GE Healthcare are configurable with ReadyToProcess filters (both cross-flow and nominal-flow styles) for sterile bioprocessing operations. And CaridianBCT’s automated system is used for growing adherent and suspension cells in a closed environment. The trend towards smaller batch sizes in bioprocessing may well provide the necessary technology solutions for commercial-scale cell therapy production. Efficient small-batch processing also provides an option to “scale out” with multiple, identical small-scale systems — rather than scaling up batch sizes. This represents a paradigm shift in strategy for manufacturing small-batch cell-based products. Adoption of single-use technology in itselfis not enough to ensure commercial viability of a cell therapy. Significant additional benefits come from functional, end-to-end closure of a process: The entire process is completed within a closed, presterilized, single-use consumable system. The benefits relate primarily to batch segregation. Also, if an entire process remains functionally closed, multiple batches can be processed in parallel within the same production area. That significantly reduces operating cost and improves the use of facilities, equipment, and labor. Fill and finish into an administration-ready format. End-to-end functional closure of a process is the real key to achieving a step change in the CoG for small-batch processing. Most industries typically associate automation with a reduction in labor. It is common for labor savings to be used as the primary financial justification for investing in automation because that kind of payback is easy to calculate. However, reduced labor is just one of many benefits that can be derived from introducing automation — and not usually the most critical of them. Of all the benefits automation can provide, an ability to deliver consistent quality through a reproducible process stands firmly at the top of the list. This is certainly true for cell therapies, to which complex manual processes are common and the risk and consequence of operator error can be high. It is perhaps sobering to consider that for an autologous therapy, failure to complete a batch is failure to treat a specific patient. Common process steps associated with risk include multiple sterile connections, QC sample collection, spiking, transfer of responsibility, batch record data entry, and labeling/ relabeling. It is also important to remember that cells are the final therapeutic product, so final product cannot be sterilized. A sterile process must be maintained from beginning to end. In one recent example, I was involved in a team analyzing a cell therapy process used for producing clinical-trial material. For what is a relatively simple process compared with many others, we identified 76 process risks. Using a risk-based design philosophy with automation (Photos 1–3), we reduced that number of potential risks to just one. Process integrity is a term used to describe the function of “error-proofing” a process. Every aspect is checked before the process can commence. The process sequence is defined and controlled so that it must be performed in a specific way (e.g., automated sequence, error-proof consumable loading, and controlled QC collection). And each process step is verified before the next begins. The benefits are often not recognized or valued during clinical trials when patient numbers are small and production is restricted to a few expert operators. But as patient numbers increase and more operators are required to perform a given process, the benefits of process integrity can be profound. In commercial production, ensuring process integrity is not merely good practice. Without it, you would have an unmanageable business risk, including the potential for failure to achieve market authorization. Numerous technologies have been developed to ensure process integrity with closed, disposable manufacturing, including sterile connectors and noncontact sensors for process monitoring and control. Finesse Solutions, for example, has a line of single-use TruFluor sensors for measuring head-space pressure, dissolved oxygen, pH, and process temperature. Millipore’s CellReady bioreactors make use of probes for controlling temperature, dissolved oxygen, and pH. If you combine the need to identify when a process is deviating from specification with the desire to use closed consumables, it is easy to see why process integrity represents what may be the greatest opportunity for innovation. Delivering it is undoubtedly the primary objective in designing an automated process for commercial-scale cell therapy production. Managing the regulatory oversight of a cell therapy process as it moves toward commercialization is a unique challenge. Remember that the process is the product. Because absolute product characterization is extremely difficult, a company must demonstrate that it can consistently reproduce the manufacturing process with every patient, every batch, every facility, every time. lity, CoG, and scale-up when they get product approval. By investigating the details of any therapeutic cellular process, you will invariably find that a unique combination of technologies must be assembled to complete it. Each cell therapy requires its own process solution. And the current status of the service sector for this market is that many process technologies suitable for cell therapies are not very readily integrated with one another. Stage 1 activity creates an opportunity to explore different process technologies and select a configuration that will integrate to reflect your process intent. Cost-modeling tools provide visibility of the cost structure that drives preferences. For example, magnetic-bead selection technologies provide robust selection methodologies but represent a systematic impost on end-product cost that is worth scrutiny. The outcome of that activity is identification of one or more preferred directions for the integrated process. Commonly, several steps have novel elements that interact uniquely with surrounding operations. QbD strategy will highlight those novel elements as high risk, encouraging early resolution through testing. The Stage 2 program is defined by that information after addressing uncertainties in process capability with practical testing. This usually involves the process development team of the process owner. Once unit processes have been verified as competent for integration into a production system, our task becomes weaving that process into the clinical trials program. A common investment dilemma often occurs at this point. Although the need for consolidating a process for clinical trial operations is important, early clinical trials represent a difficult point in a fund-raising cycle, especially for start-up organizations. Investment in fully automated production equipment, disposables and tooling, control software, and a validation package is difficult to justify when a therapy’s efficacy has yet to be proven. 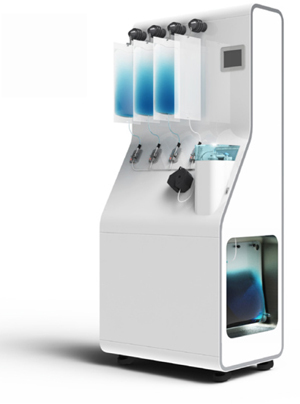 To help manage the transition from clinical trials to commercial production, Invetech recently introduced the concept of a flexible clinical trials prototype (Photo 4) that incorporates a broad range of proven processing technologies such as tangential-flow filtration (TFF), centrifugation, and media addition. This should enable a cell therapy company to configure preferred process technologies into a semiautomated system for use in producing clinical trial materials, knowing that it uses the same processes that will be run during commercial production. With a consistent process supported by the clinical trials prototype and robust clinical results, a therapeutic product can be well positioned to transition into profitable commercial operations. Clinical trial success can then trigger larger investment for more comprehensive integration of the process into more fully automated systems. Stage 4 is creation of such an integrated system. The fully automated systems create opportunities in their own right once product approval is received: particularly, the ability to “scale out” production capacity by replicating equipment without relying on highly skilled personnel who can be difficult to find, train, and retain. These systems discount the need for dedicated high-grade process facilities that present a major commercial and time-scale obstacle to profitability if more products must be delivered. Stage 5 is replication of the processing system. The bioprocessing and cell therapy industries are converging on the challenge of small–batch-size production from different ends of the batch-size spectrum. Opportunities abound for innovative technology providers to leverage existing technologies and bridge the gaps that currently constrain commercial-scale production. For most cell therapy companies, a closed, automation solution that is scalable, that provides a viable CoG, and that satisfies regulatory requirements is essential to commercial success. Through a paradigm shift in thinking about small-batch production, patients will ultimately benefit through access to high-quality therapies at the lowest practical cost. David James is life science and pharmaceutical director at Invetech Pty. Ltd., 495 Blackburn Road, Mount Waverley, Victoria 3149, Australia; 61-3-9211-7742; david.james@invetech.com.au, www.invetech.com.au. 1.) Scott, C. 2011. Sustainability in Bioprocessing. BioProcess Int. 9:25-36. 2.) 2011. Antibodies, GE Healthcare, Piscataway.